So many Superhero party ideas and so little time! 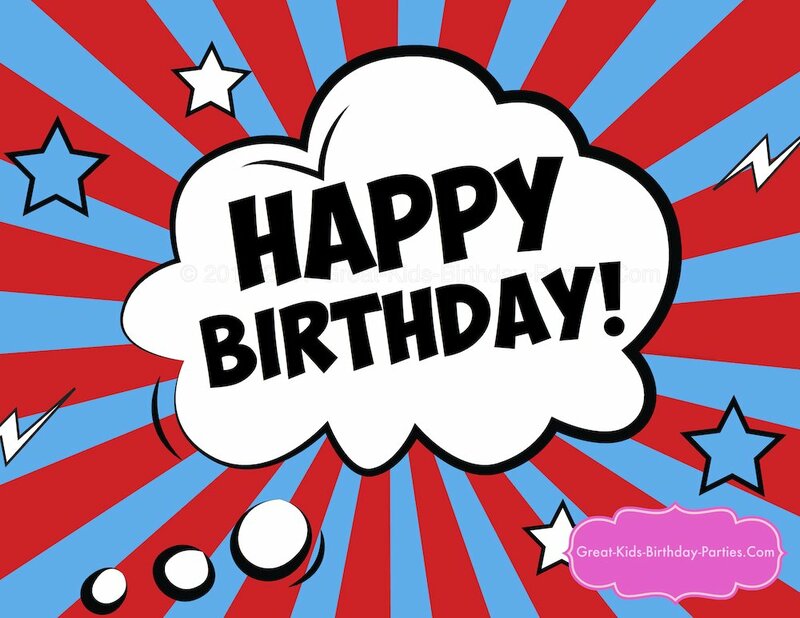 I mean really, there are so many Superheroes and groups of Superheroes like for example you have Superman, Batman, Spiderman, Iron Man and Captain America who are all great as a birthday party theme all their own. Then, you have them join with other Superheroes and now there's X-MEN, Justice League, Avengers and so on, all of which are also great party themes. So before planning, it might be a good idea to check with your little one on exactly which Superhero they want for their birthday party. Although, I suspect they might have made this abundantly clear. Then there's color schemes which can vary depending on the character and yet there are some colors that are good for most characters. 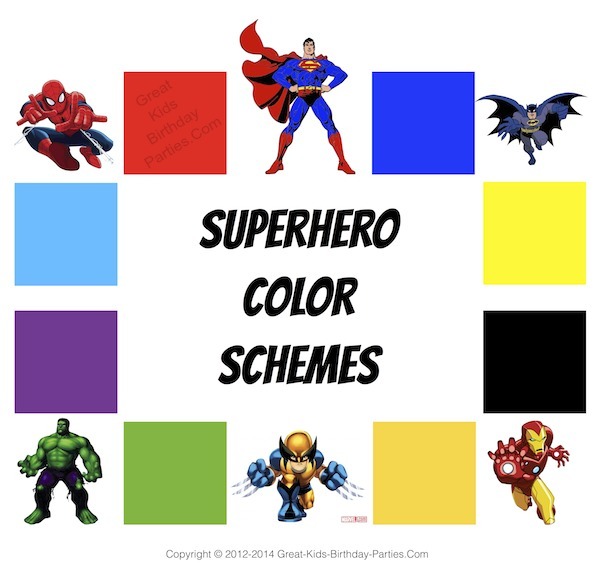 Primary colors of red, yellow and blue are the colors most associated with Superheroes. One of the easiest ways to pick your color palette is to look at the color on your party plates or cups. This is also a great way to decide on balloon colors and additional decorations. Prefer sending your invitations via email or social media? One of our favorite Superhero party ideas is this Superhero invitation that you can make in minutes! 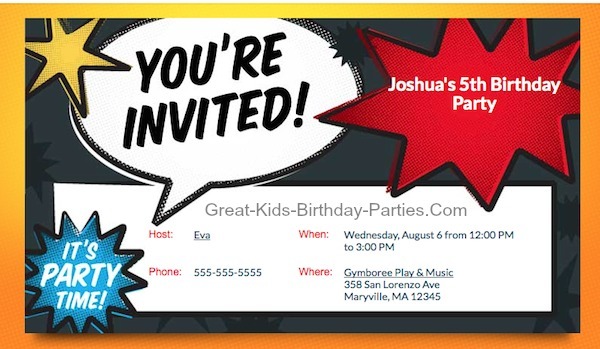 Just fill out the party information and your invitation is complete and best of, it's free from evite. Click here to begin making your own. Make sure to have all your email addresses handy if you're going to email them. Otherwise just post to social media and your done. 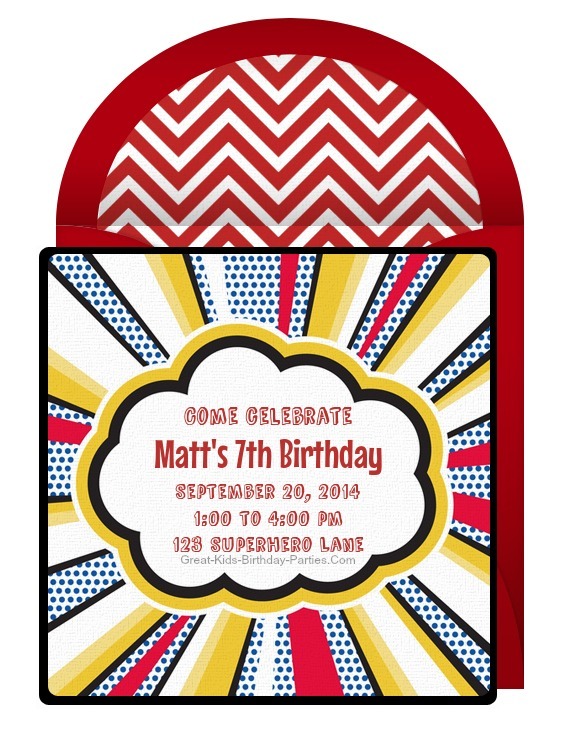 To see free printable invitations visit our Superhero Printables Page. This Superhero invitation from Punchbowl has that custom feel and the best part is that's free. This invitation is also easy to fill out but depending on the amount of lines in your party information, you may need to use their size and editing tools so that all your information fits in. They also have 24 different fonts to choose from which is quite nice. Once you get the hang of the editing tools it's actually quite easy. Click here to begin. Click on the Free! Get Started green button to start. You will have to answer 2 questions before choosing a style. Not all invitations are free but you can tell by hovering over the invitation and a sign will appear letting you know if it's free or premium. Brand NEW!! 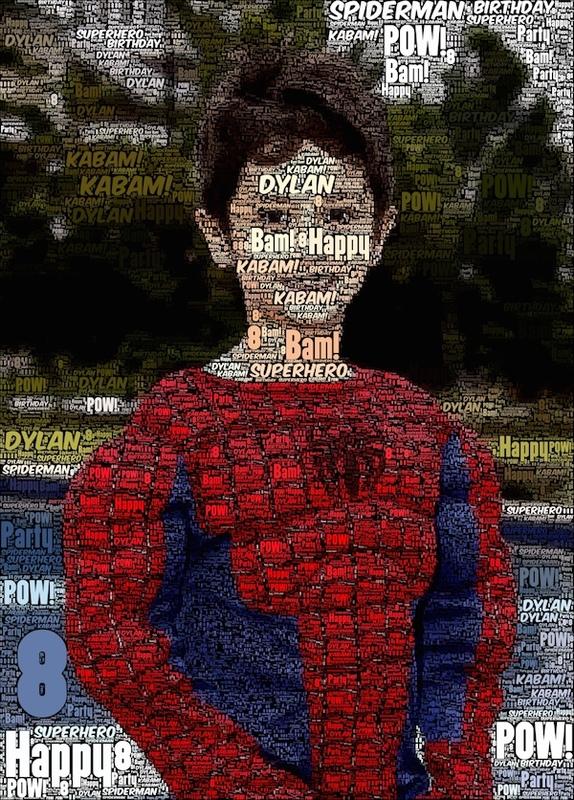 Made some "extra special" large Superhero Word Bubbles in 6 different styles. These large action bubbles are great for centerpieces and party decorations. Purchase them at our new Etsy Store. This is so much fun!! Use your own pictures, then add your own words (up to 10 words) and you get this super cool photo that you make yourself...AND it's FREE! These are great for invitations, as a birthday gift or just for fun! Even cooler is the fact that you have a bunch a editing features including fonts, background color, styles and much more than what we used for our Superhero pictures. To make these fun photos you will need a smartphone. First have the picture you want to use ready on your phone then download the free App "WordFoto" by bitCycle Ab. Once you open the app, upload your photo. Then click on the "T" (at the bottom of screen) and select "Add new Word Set". Now you're ready to add words. After you add your first word, click on the "+" on the top right hand corner, this will give you a new box for another word. You can choose up to 10 single words, so if you want "Happy Birthday", you have to put "happy" on one box and then birthday on another box. We made a quick change on the same photo just to show you one of the features. The 2 pictures below are exactly the same photos as above except we changed the background color. Depending on your background color, your words will show more or less. Notice the bottom left corner of all 3 images. See how you can't see the words in the picture above? That's because the picture above has a black background and the words on the left are black. Also notice that the placement of the words change every time you make a color change so we suggest you decide on color first then click on the big "T" symbol that says "words" and then select your set of words (that you made earlier). If you don't like the placement just repeat the process and you'll get a new look because the words move around randomly. CAUTION: This can get very addicting! If you see a pattern of words that looks good with your picture, SAVE IT!! You can save it to your photo library on your phone or email it to yourself so you can use it (we did both). Then you can continue to play around with all the features but your picture is saved. Woohoo! 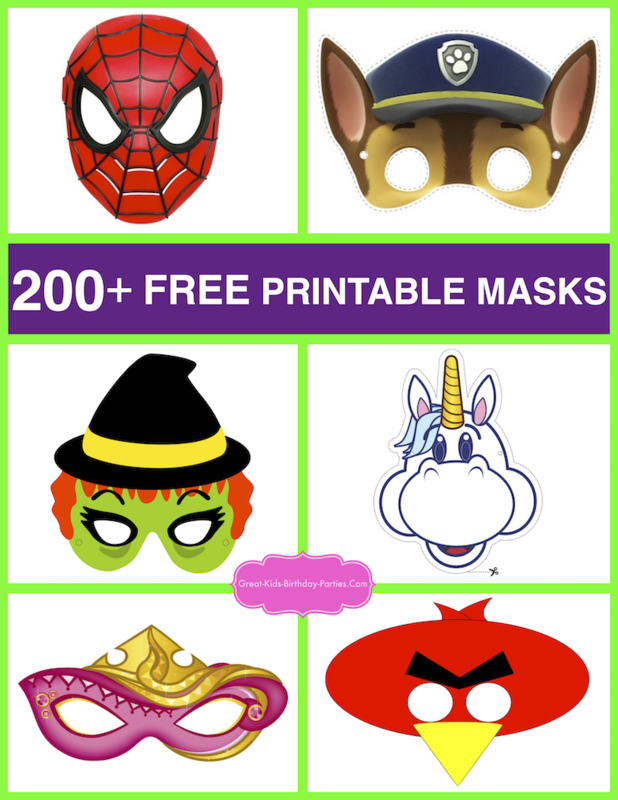 Printable Superhero Masks Galore! Having a Superhero party? 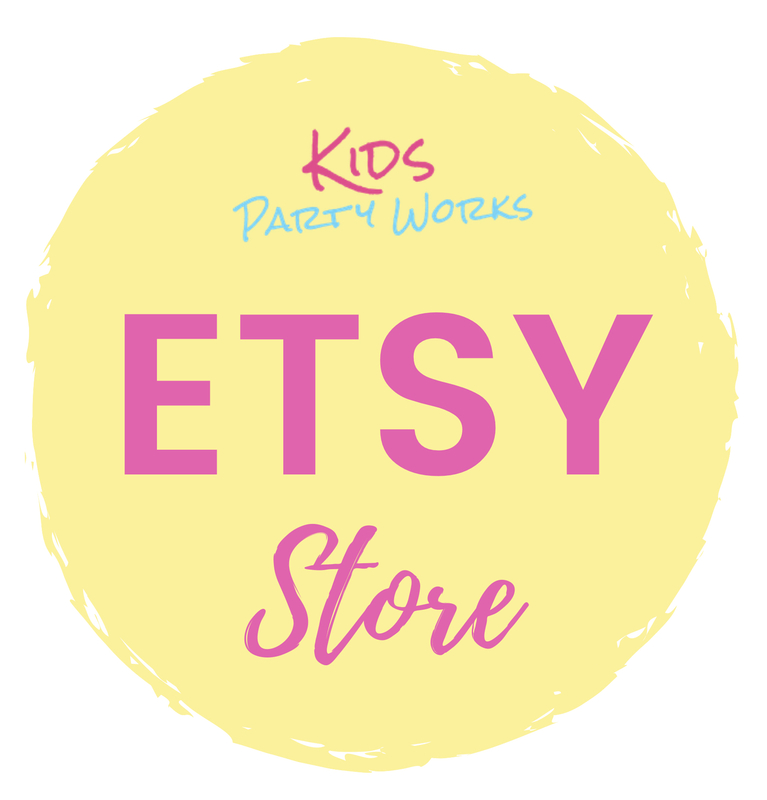 If so, come check out our super cool kids printables masks! We designed this package with little superheroes in mind. with 43 masks, there is plenty to choose from including Iron Man, Black Panther, Captain America, Spider-Man, Wonder Woman, Superman, Batman & Robin, Flash, Thor, Hawkeye, Falcon, Cat Woman, Wolverine, and lots more superhero masks to be whoever you want to be. What's your identity? Visit our Etsy store for details. We just love masks! 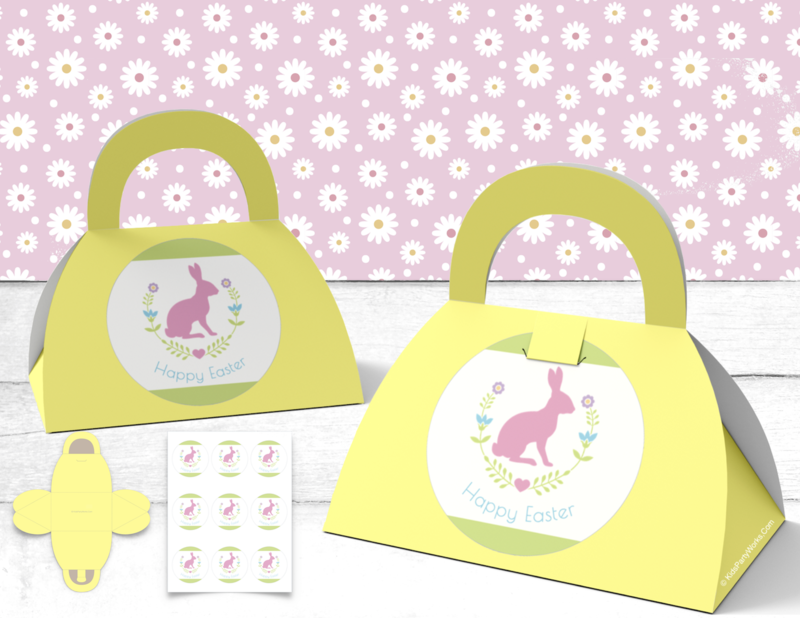 They are always such a hit at a children's party, playdate or pretend play. 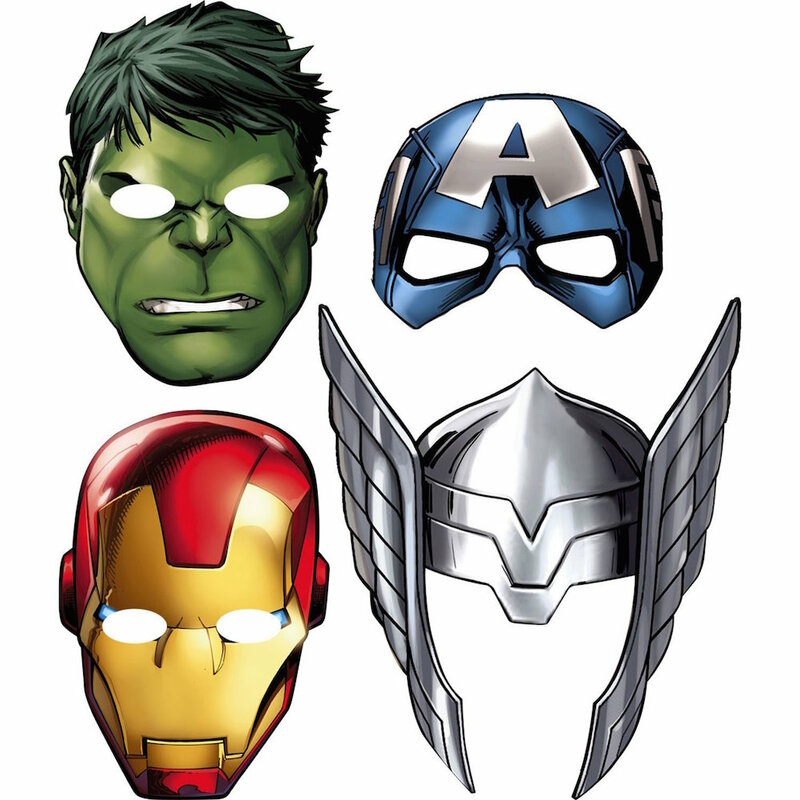 For a selection of free printable masks, visit our Superhero Printables page or if you just don't have time to print, you can get these paper masks below which include The Hulk, Iron Man, Captain America and Thor here or these without Iron Man here. 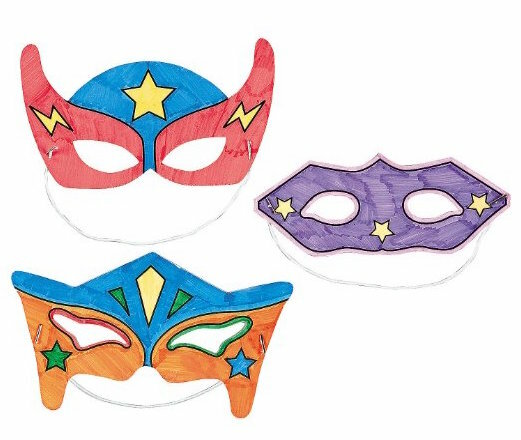 These Superhero masks are fantastic for a Superhero themed party. Kids can use markers (washable? ), stickers and foam shapes to decorate and personalize their own mask. Best part? Eyes come pre-cut! See details for Superhero Masks. 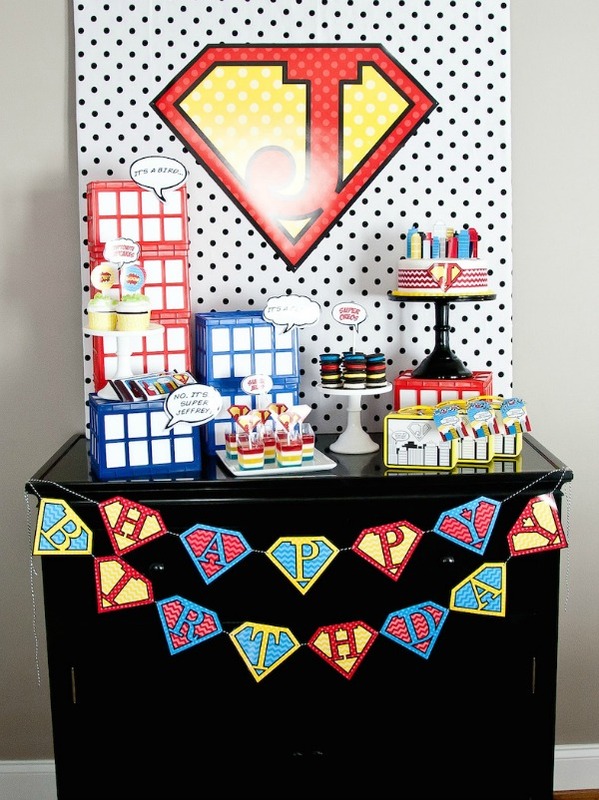 Here are some fun and colorful Superhero party ideas. 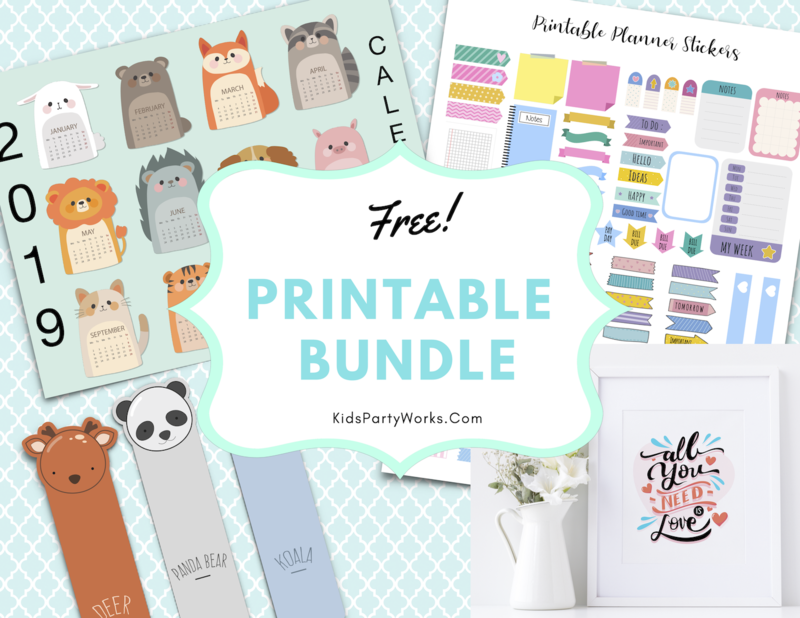 These images that we designed work great as stickers and/or cupcake toppers and are absolutely free. 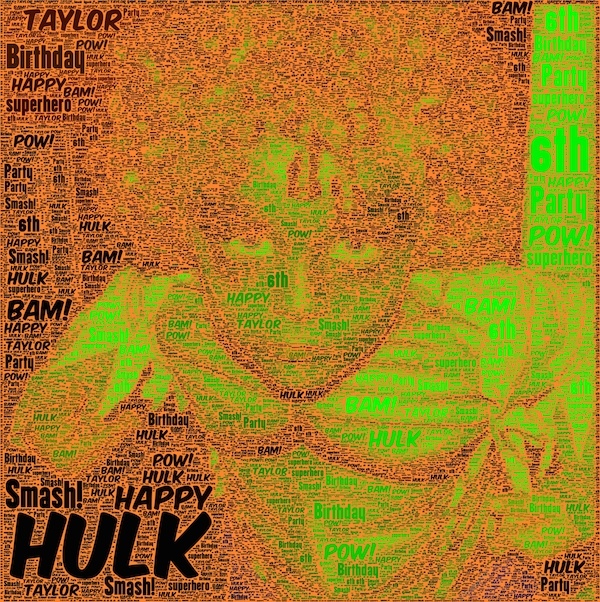 Click on image for free download. There are various ways to print them. For stickers you can use Avery round labels # 22830 which comes with the circles pre-cut. Make sure your printer is compatible with the paper you choose. Another way is to print them on a full-sheet sticker sheet and then cut them with a 2 1/2" (6.35 cm) paper punch. Below is the sticker sheet and the paper punch in case they are not available in your area. Click on image for details. 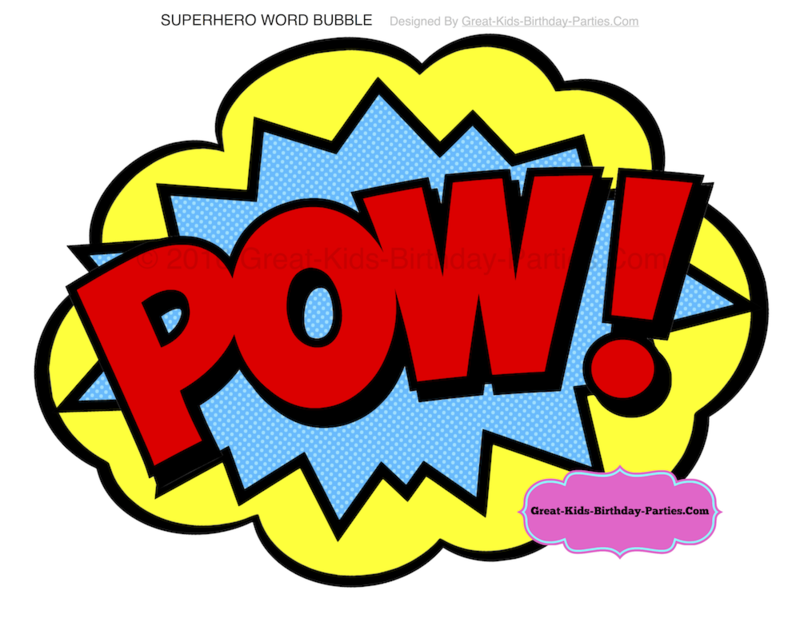 Here's a fun Superhero happy birthday sign for any Superhero themed party. Best part?......It's FREE! 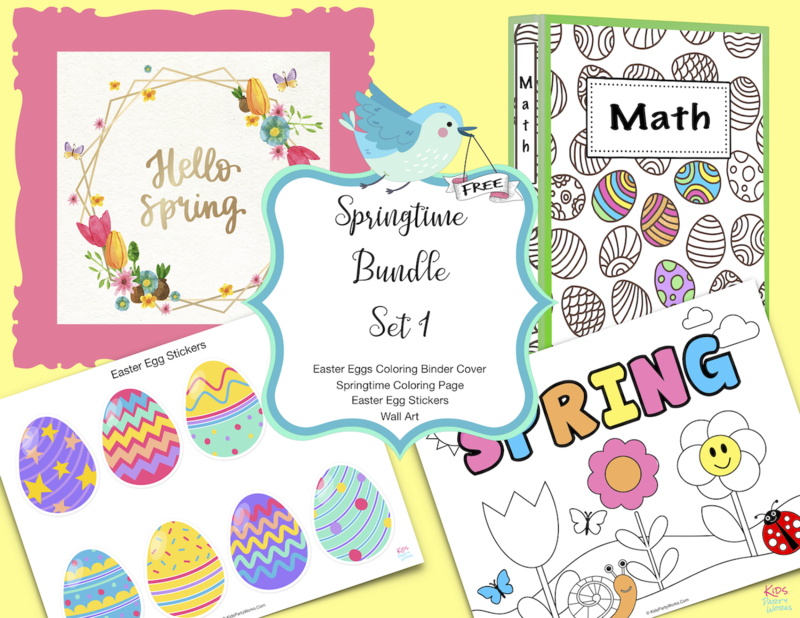 Download your printable here. Oh my goodness! 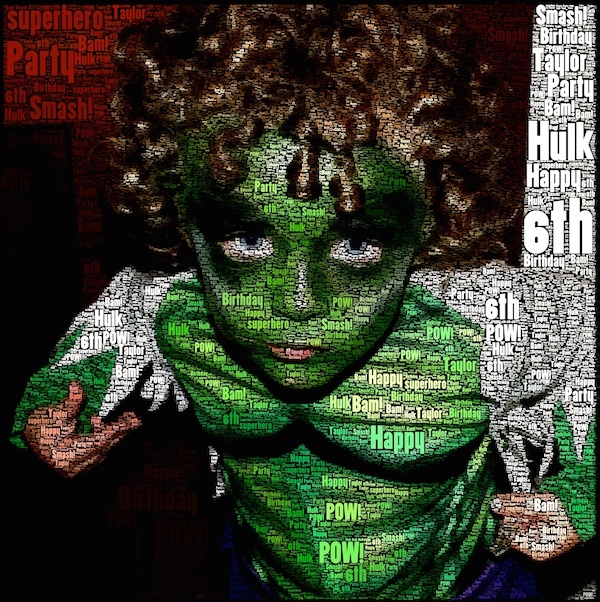 This is the perfect gift for Superhero fans! 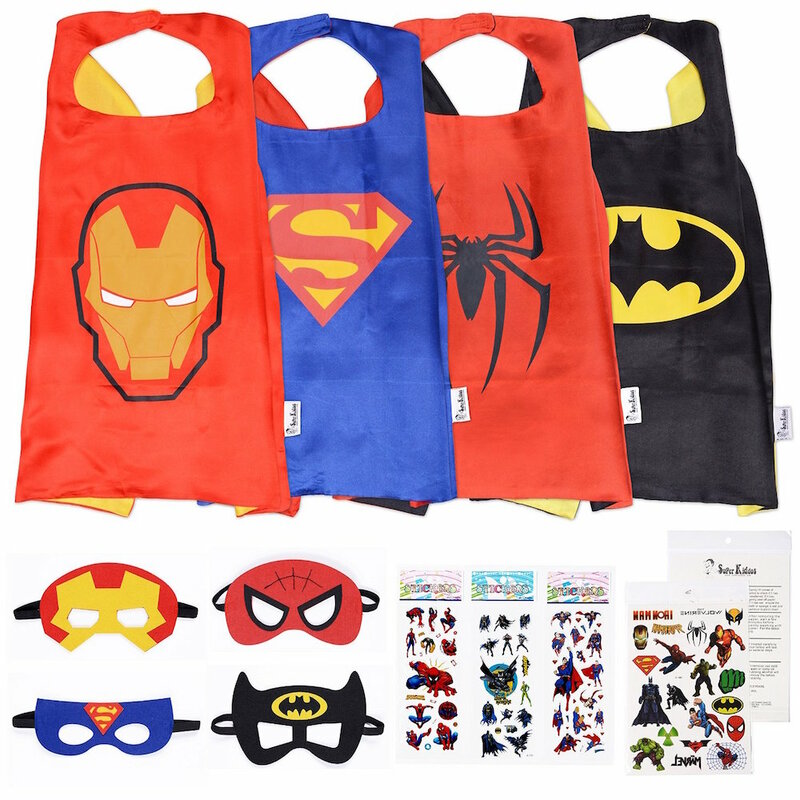 It comes with cape (adjustable) and mask for Batman, Spider-Man, Superman, and Iron Man. It also brings temporary tattoos and stickers. 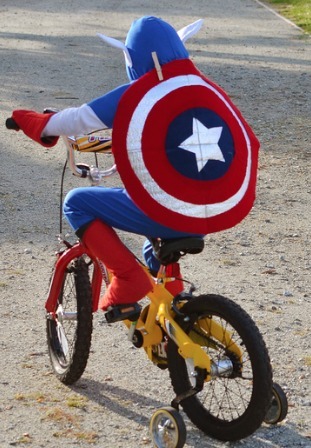 This kit is also great for a Superhero party activity, playdates and dress-up fun! See details for the Superhero costumes. In a hurry? 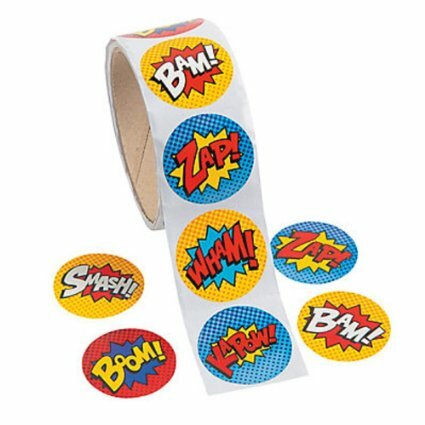 These Superhero peel & stick stickers are great! 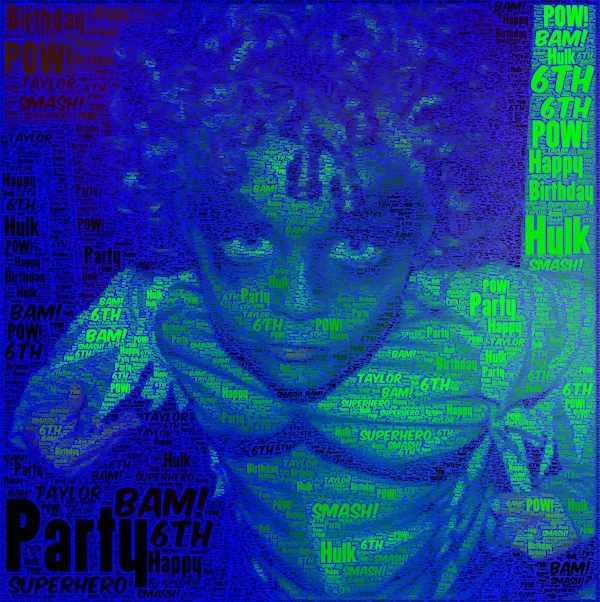 The bright colors and the superhero text blend perfectly with any superhero party. This sticker roll comes with 100 round paper stickers, size 1.5" (3.8cm). Click here for details. 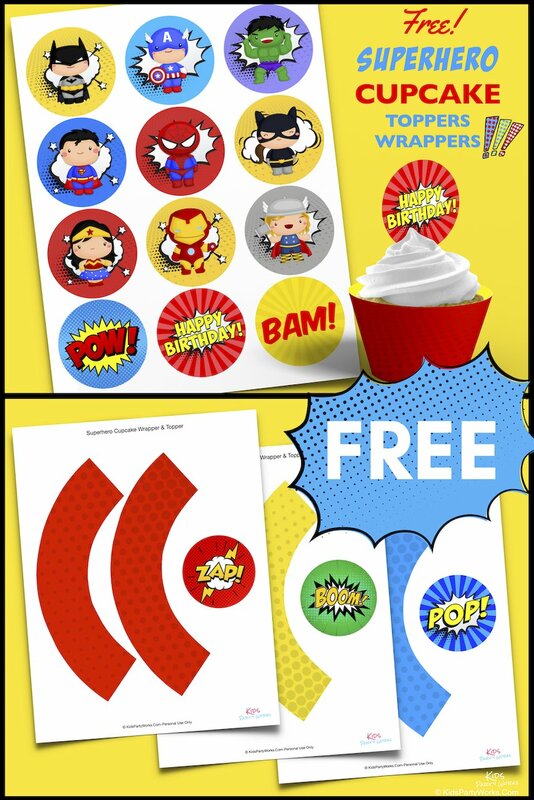 Fun cupcake wrappers for your Superhero party. 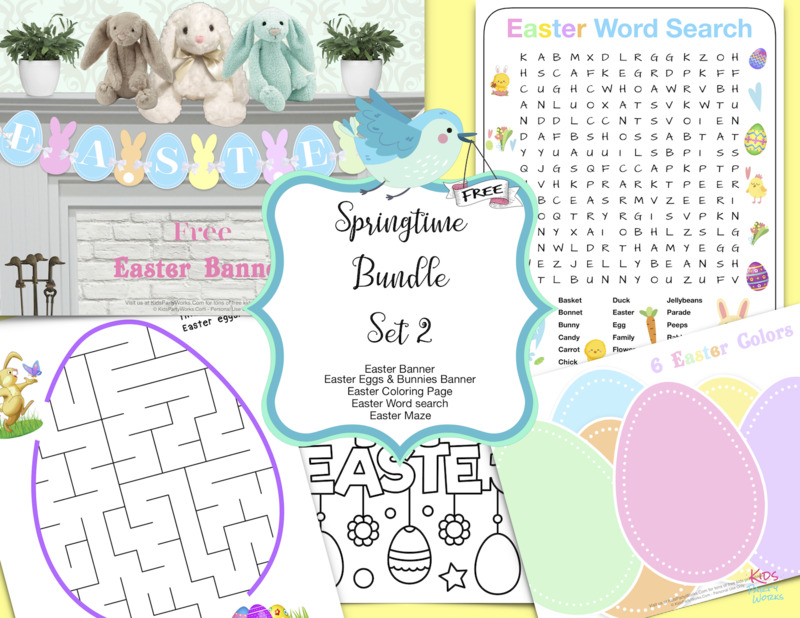 Click on image to download (2 per sheet). Let's start with 2 superhero pizzas. Easy to make and fun to eat! I'm visual and not an expert in the kitchen, so I love seeing how to make recipes. And for this, I turn to trusty videos. Watch Ro make this easy superhero Captain America pizza which will make your superhero guests smile with delight. She uses a large cookie cutter, pepperoni and black olives to complete this yummy party pizza. Ready for a Batman pizza? Come join Ro and her dad as they make a Batman pizza. You'll need a Batman cookie cutter for this one but it's super easy to make. 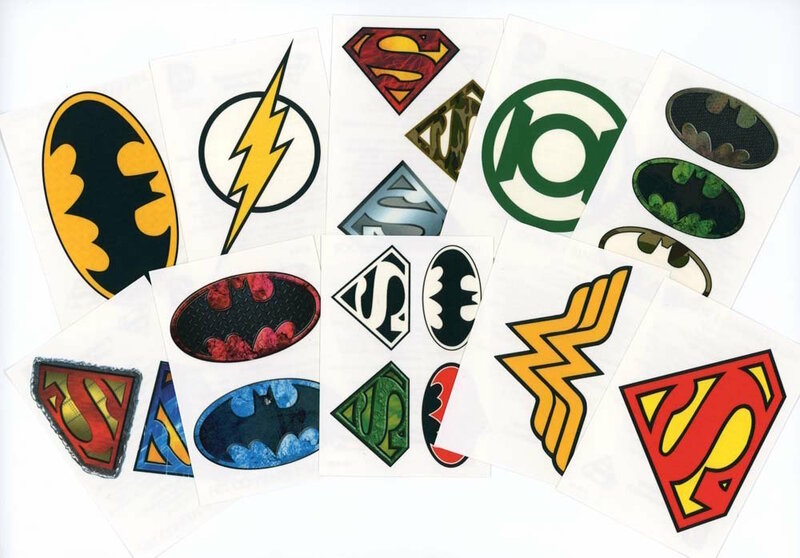 These Superhero tattoos will be a hit at your Superhero themed party. Make this an activity at your party. I remember doing this with my girls at their birthday parties when they were little. Just make sure you have enough for everyone! See details for Superhero Tattoos. 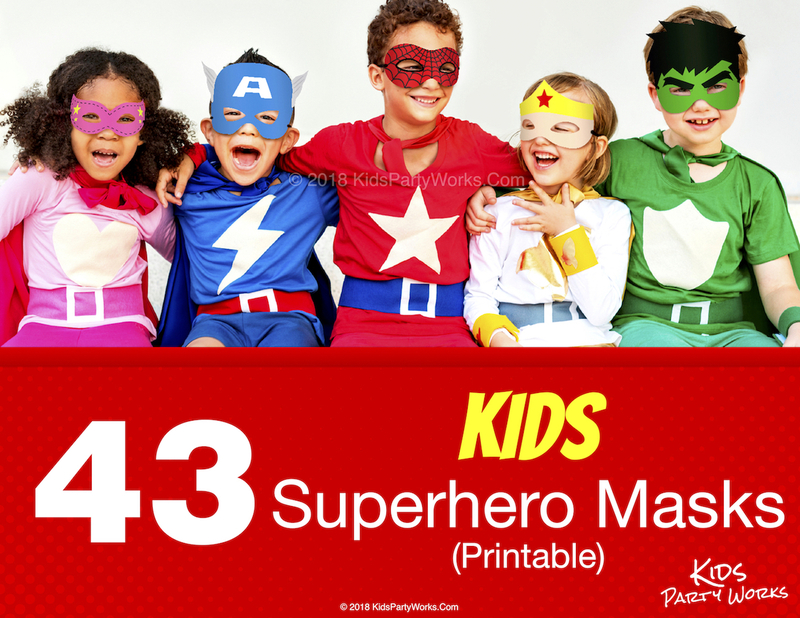 Need Superhero party ideas? 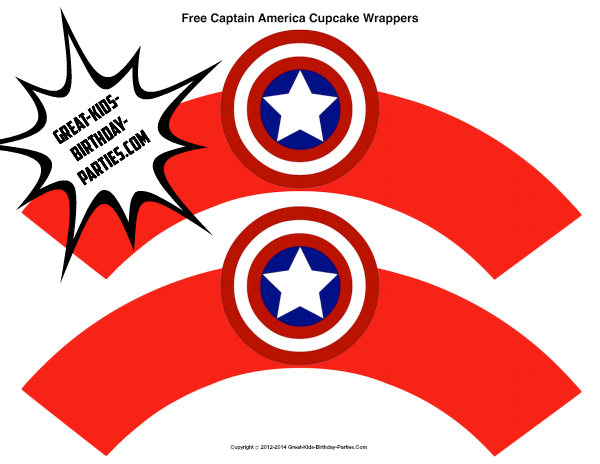 We made these fun and FREE Superhero thank-you tags for your party favors. Use them to seal up your favor bags and boxes. They come in 2 different colors and shapes. The blue circular stickers are smaller and print 12 stickers per sheet. The red circular stickers are larger and print 9 per sheet. 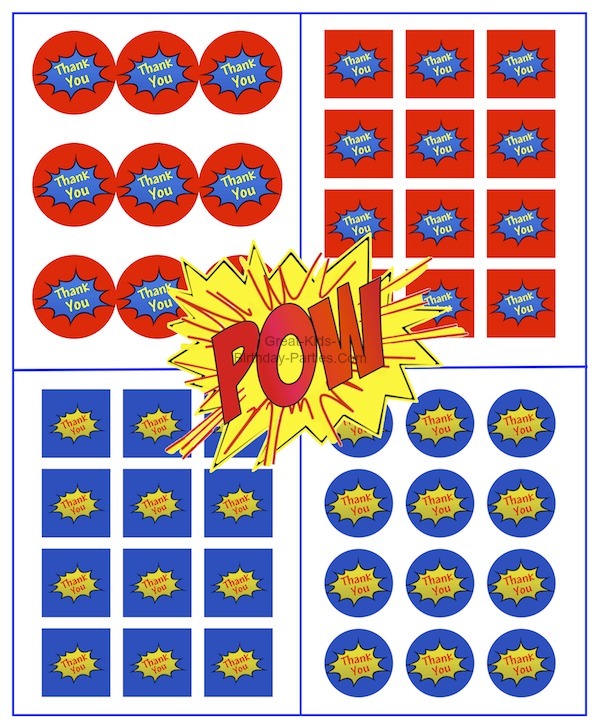 For your free download visit our Superhero Printables Page. Great gift for Avengers fans! What child doesn't want to see their name up in lights? What a great way to personalize their room. I used to personalize my girls' things (pencils, stickers, lunch boxes) when they were little and they loved it. 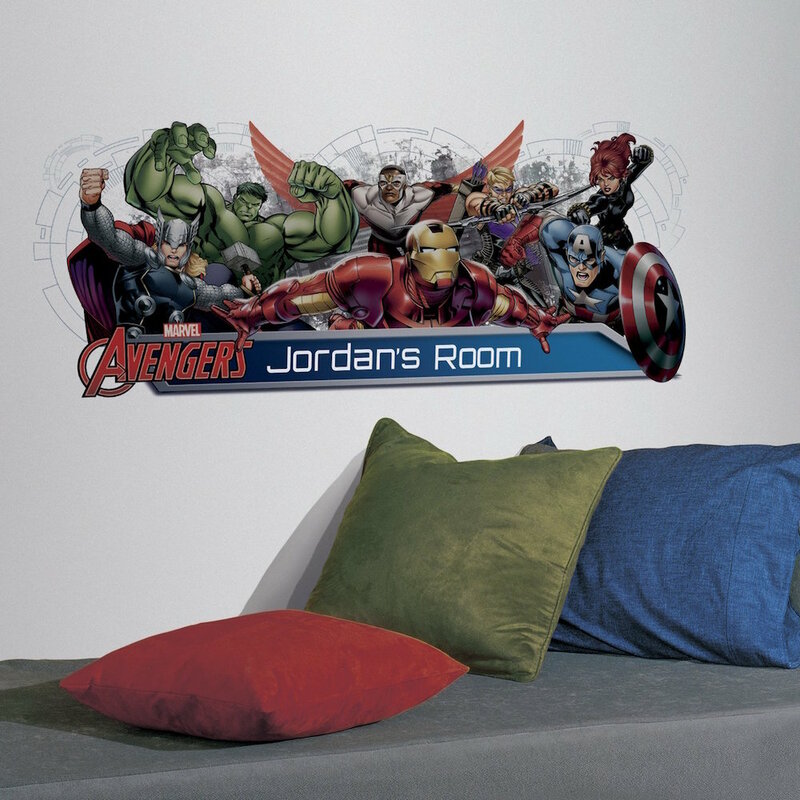 See details for Avengers Room Decal. 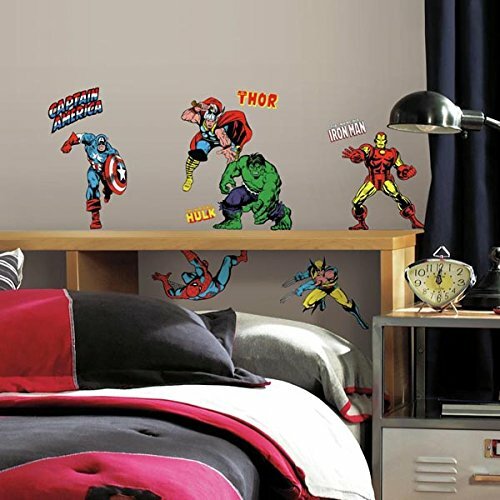 We love this set of Superhero wall decals. 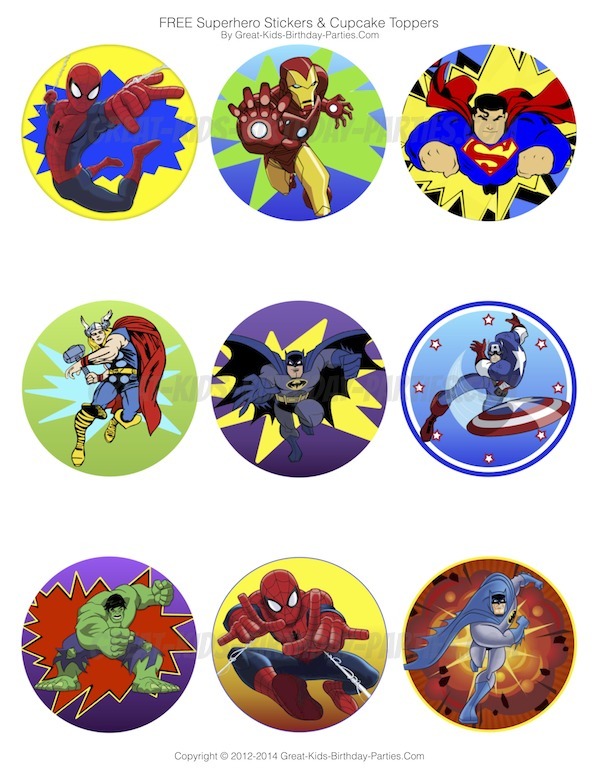 The decorating possibilities are endless in this set of 32 decals (different sizes) with a variety of Superheroes. And the best part? Decals are repositionable! You can get them here. Love this Captain America Cake and it's cool on the outside AND inside. When you cut a slice out, it the American flag on the inside. Pretty cool! See for yourself! 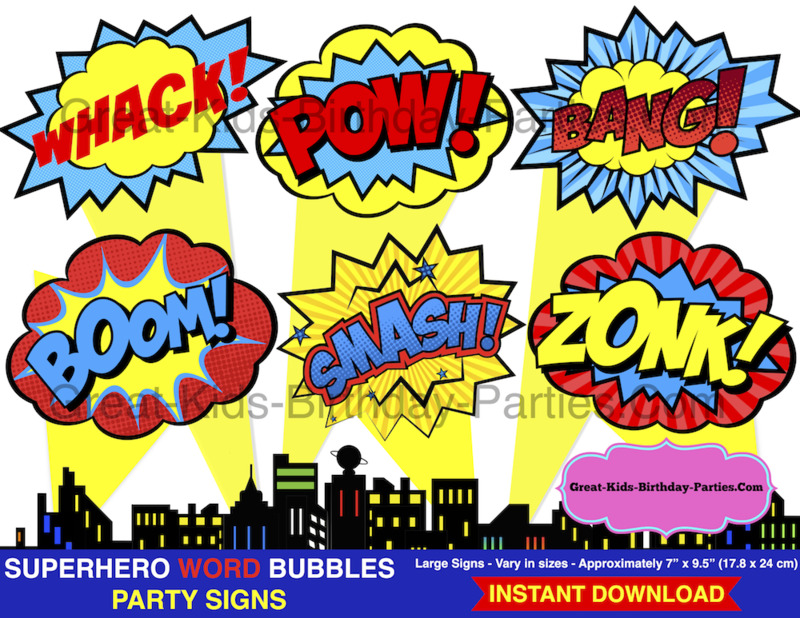 For more fun Superhero party ideas visit our Superhero Printables Page Here.